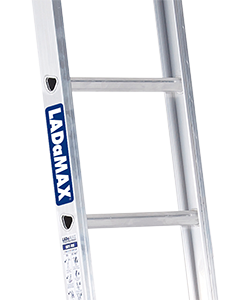 When it comes to ladder safety, Ladamax are dedicated to creating the most reliable and versatile products on the market, ensuring any and all trades people are able to use them in their workplace and make it safely back home each night. To ensure utmost safety for all our users, particularly those working with electricity, Ladamax has designed a range of non-conductive ladders made of fibreglass, timber or other non-conductive materials that are safe to use where electrical hazards exist. This not only makes them safe for electricians to use in their work, but also adds another level of safety for all users working in an environment where electricity is present. 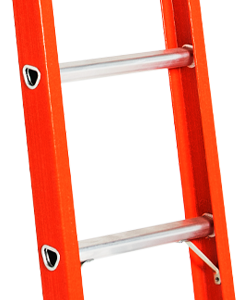 Ladamax only uses the most reliable, purposely engineered material in all of their ladders. With the fibreglass range, they have taken this care, and focus on safety, to the next level to combat the extreme UV radiation in Australia by using UV inhibitors in our fibreglass material. This improves product life, reduces fading and means that the entire fibreglass range is better value. This is the Ladamax difference. 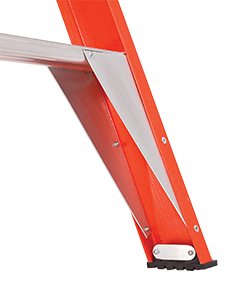 Our range of Aluminium and Fiberglass ladders are the height of safety, with all products meeting the AS 1892 safety standard. In addition to meeting this safety standard, our in-house manufacturing team has put Ladamax ladders to the ultimate load test and the platform and warehouse range of ladders were able to withstand a load of up to 500kg without warping or bending. With user safety always at the forefront of our minds, we’ve successfully combined unique designs with high quality, cutting edge materials to create a range of unparalleled products that not only ensure customer safety, but also allow for durability, versatility and ease of use. Our ladders are significantly more lightweight and portable than any others on the market, making them perfect for people constantly on the go. Most importantly, we manage this without sacrificing the overall strength of the ladder, guaranteeing the safest, easiest to use product for our customers. 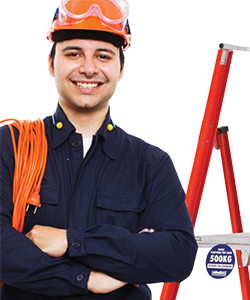 One of the most common workplace injuries occur when falling from a ladder. That’s why Ladamax are committed to ensuring our products actively help minimise the risk of ladder related incidents and accidents in the workplace. One of the ways in which we do this is through the use of ‘Gusset Gutz’. Gusset Gutz is a reinforced base brace system that provides extra strength at the base of the ladder, allowing for increased strength and stability. 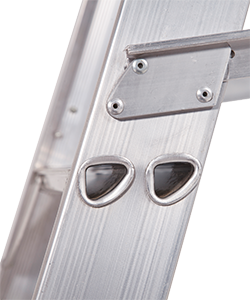 Gusset Gutz base braces are used on all step ladders and part of our standard range of platform ladders. 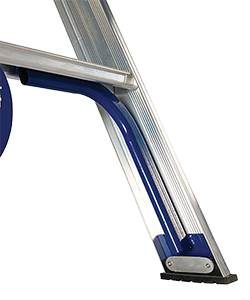 Another unique design feature, Strongbow base brace stiffens and provides increased strength to our premium range of platform ladders. Strongbow is a reinforced base brace system that provides extra strength at the base of the ladder, allowing for increased strength and stability. 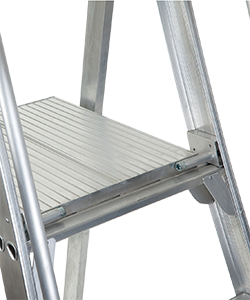 Strongbow is currently available as part of our premium range of ladders which are perfect for contractors and professionals who want only the safest, premium products in their workplace. As leaders in the industry, Ladamax takes no risks with our products or our customers, ensuring all products within our range meet required safety standards. 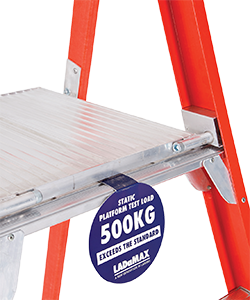 As per the AS 1892 standards, which sets out the minimum recommended safe practices and requirements for the selection, use and maintenance of portable ladders, all Ladamax ladders are tested to comply with the 150kg rating. Throughout our 18 years in business, Ladamax has revolutionised the industry with our unique designs, high-end products, superior quality and continued dedication to the safety of our users. During these 18 years, we are proud to say we have had zero claims on ALL our products, with no ladder frame produced by us having never been the cause of an accident. With so many years of experience, skills, knowledge and stellar record of zero claims to back us, it’s no surprise Ladamax is the preferred brand for tradies. Our ladders are all Australian owned, made and produced, making use of premium Australian products and craftsmanship. With nearly two decades of trading under our belt, Ladamax has firmly established itself as a leader in the industry, boasting a number of Australia’s leading industrial companies, mining, oil and gas companies, and electrical instrumentation companies as our clients.